All Out Adventures is a Terra Trike, Catrike and TridentTrikes Dealer! 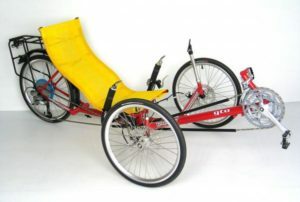 We have been using recumbent trikes at our adaptive cycling programs since 2007 and we believe this style trike offers safety and independence for many of our riders! Excellent stability and steering. Requires large turning radius, but is fine for the bike trail. Comfortable seating position for neck and back. Seat is low to the ground. Assistance may be needed for transferring on and off the bike. Can be adapted with foot plates for either side or both sides to secure the heel and toes to the pedal. One can steer and brake with either the left or right side. 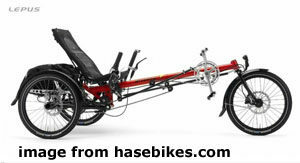 Sizing: we have a XS, S, M and Large Terra Trike Cruisers as well as two tandem recumbent trikes. Call the office at 413-584-2052 to determine your size. Comfortable position for neck and back. Stable and easy to maneuver. No gears. Just good old fun. Seat is adjustable to accommodate leg length. Riders ages 5 to 10-years-old usually ride this bike. Bike can be steered with one hand. 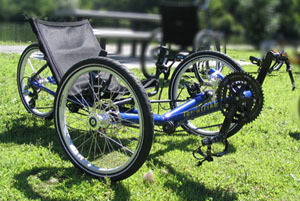 "Delta" style trike wheel in the front instead of two. Can be adapted with footplate pedals. 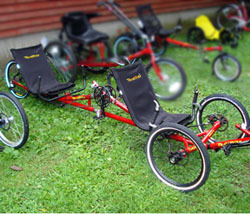 Seat is higher than our other "tadpole" style recumbent trikes, which makes for an easier transfer. Sizing: this particular program cycle is sized for those 5'8" and up. Offers stability in an upright cycle. 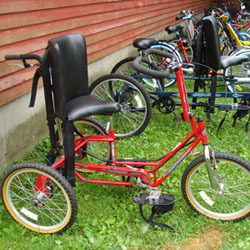 We have observed that this bike is easier to steer for most people than the standard adult trike because the rider sits further back and cannot inadvertently put too much weight on the handlebars. 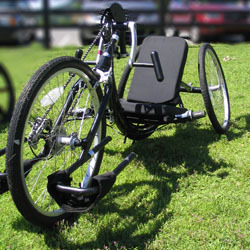 This bike can be adapted with footplate pedals so that it can be ridden by someone with weakness on one side of their body. New to our programs this year! 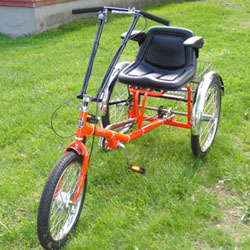 Offers some of the stability and peace of mind of a trike, but with the feel of a traditional 2-wheel bike. 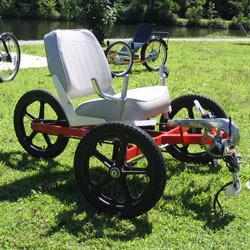 Pedal crank is positioned so that the rider can sit on the seat and put one's feet down while still having the proper leg extension for pedaling. Wide, very comfortable seat eliminates any discomfort. Seat backs offer back support. Bike is pedaled with person's hands. 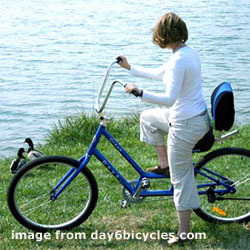 This bike shows a "glove" style hand grip that will hold a person's hands snugly in place with a quick release feature. Hand pedal grips can be swapped out to a different style. Pedal backwards to slow down and stop. Seat and foot rests are adjustable. Bike is pedaled with hands. Bike is faster than upright models. Front wheel may rub on a person's leg while turning if they are not able to move their legs out. 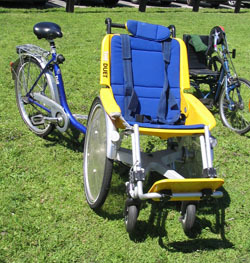 This bike allows both the front passenger and caregiver to zip along the bike path and cover some ground. Person in the back, steers, brakes and pedals. Person in the front is a passive participant. Front seat features include adjustable head and foot rest and lap and chest belts. 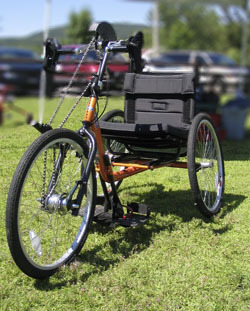 Back detaches from the front wheelchair for easy access to the restrooms or ice cream stand. Person in the front steers, brakes and pedals. Person in the back, the "stoker" can pedal with gusto or do a range of motion exercise. This is a single drive train bicycle so both front and back pedals rotate simultaneously. 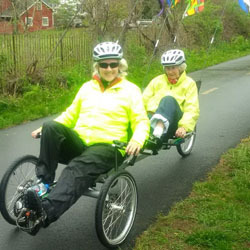 We do have one Independent Pedaling System Tandem Rover, where the captain and stoker can pedal independently at their own cadence. Seats are adjustable. Chest strap can be added if needed. Foot plate pedals that hold the foot securely on the platform pedal are available. Person in the back walks while pushing, steering and braking the bike. Upper torso and waist belts available as well as a neoprene chest strap. Offers stability for tandem riding. Just like traditional tandems, the Captain sits in front and is in charge of steering and braking, The Stoker sits in back and pedals. Single drive train to help with both Captain and Stoker pedal in synch and help each other. Sizing: Front Captain seat is a S/M size frame to fit riders approx. 5'3"-5'-7". Rear Stoker is a M/L frame to fit riders of approx. 5'6"-6'0". 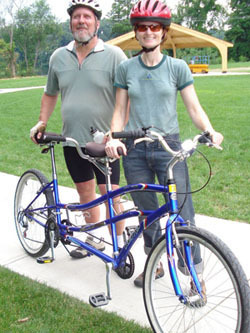 Recreational tandem bicycle with fat tires. Captain rides in front and steers, brakes and pedals. Stoker sits in back and pedals. Sizing: Captain (front) frame fits riders 5'5" and up. Stoker frame is lower in the back and can accommodate riders approximately 4'9" - 6'2".